I just had to go and take a peek at the Martha Stewart Xmas ornaments at Kmart. 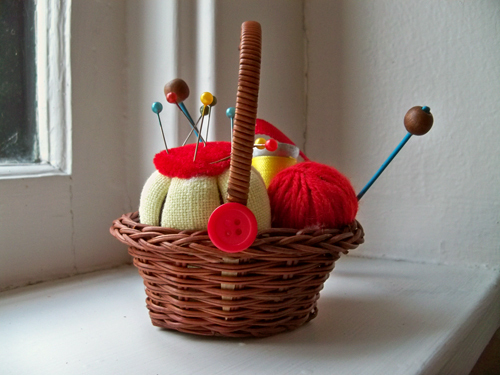 I liked this one the best, a teeny little sewing basket. It would be great to do a tree of just craft ornaments. Too funny. I had the same posts. That is a great idea. Perhaps a mini tree? I am so behind on my blog RSS feed reading! ps - I wish we had a Sonic too and the tater tot casserole looks delish! It's ok Jenny. I meant my other site. I am sorry I didn't post it. www.ani4775.wordpress.com. Sorry you don't have Sonic either. :( Hope you enjoy the casserole! Our tree is food themed. All beautifully crafted glass ornaments of food. Even a prosciutto ornament -- and plenty of Starbucks cups. hi there. i thought you might be interested in this blog about a pug. pretty cute. That peeps store is soooo cool! Roadtrip! The Keep Calm pendant is very cute. I would love to have a tree in the kitchen with a food theme - I have kitchen utensil ornaments from the Kmart Martha collection last year. I think that is the pug that pushed a baby carriage around town!